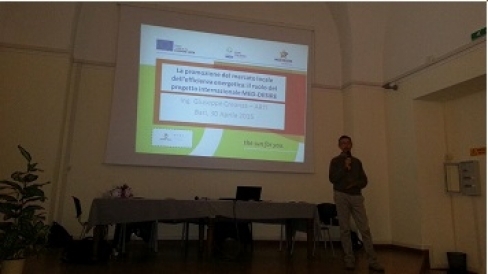 On April 30, 2015, an interesting initiative concerning "Green Economy Education" went on in a technical high-school of Puglia Region, the "Panetti" institute, which provides curricula in electronics, automation, telecommunications and computer science. Several speakers alternated themselves, covering a variety of topics like the job opportunities in the green sectors, the recycling and valorization of wastes, energy efficiency solutions for school buildings, the use of residual urban spaces for small scale vegetable gardens and, last but not least, the role of international cooperation for the promotion of energy sustainability and the specific contribution of the MED-DESIRE project. The main players of the event were however the students themselves, with their curiosities, questions and presentations of on-going and already realized projects.